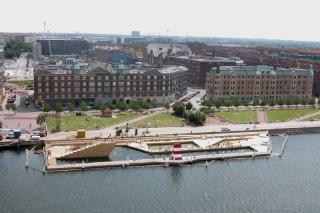 The harbour baths (Havnebadet) at Islands Brygge in Copenhagen were designed by the Danish-Belgian architectural firm PLOT, and opened in 2003. The complex is a raised rectangular wooden structure supported by pontoons. The most striking features of the complex hark back to the heavy shipping traffic that once crowded the harbour. The diving tower is shaped like the bow of a ship, while the lifeguards' lookout resembles a ship's funnel. The consistent use of wood throughout the structure is a direct reference to the design of public baths in former times. The baths are laid out as a welcoming, open-plan complex - as a social meeting place for visitors of all ages, with paddling pools for children and pools for swimming and springboard diving plus a "deck" for sunbathing. A success from day one, the Havnebadet complex is now a central feature of the recreational, social and cultural park called "Havneparken" along the urban waterfront. The modern metropolis faces a mammoth challenge: its sheer growth, leading to city-dwellers clamouring for more green amenities. Happily, new solutions are emerging such as Havneparken, a public park on the waterfront of Islands Brygge complete with harbour bathing facilities for outdoor recreation in the heart of the city. Another example of green innovation is the Nørrebro district's high-rise roof garden designed by Belgian architect Julian De Smedt – one of the prime movers of the no longer existing architectural firm PLOT. The architect refers to it as "a hedonistic rooftop", underlining the new concept in urban-style neighbourhood recreation. Play, pleasure and outdoor living are just as important as being able to hang laundry out to dry. This principle is reflected in the fixtures installed in the high-rise roof garden: a playground, a grassy 'hill', a lookout platform, an al fresco kitchen and sundeck, all of which invite the occupants to hang out and enjoy life. The harbour baths and roof garden are closely linked with a new "pragmatism" in architecture. But besides a mission to make the best of things, this architecture is visionary, practical and optimistic and not least committed to sustainability and liveability. Through his projects Julian De Smedt has given Danish architecture innovation and inspiration.